This Ice Is Nearly As Hot As the Sun. Scientists Have Now Made It on Earth. 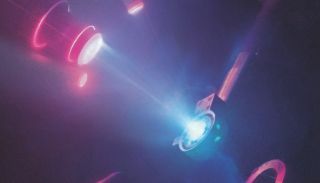 Time-integrated image of a laser-driven, high-pressure experiment to produce superionic ice. It's both solid and liquid, it's 60 times denser than ordinary water ice, and it forms at temperatures almost as hot as the sun's surface. It's superionic ice — and for the first time, scientists have made it in the lab. This high-pressure form of water ice has long been thought to exist in the interiors of Uranus and Neptune. But until now, its existence was only theoretical. "Our work provides experimental evidence for superionic ice and shows that these predictions were not due to artifacts in the simulations, but actually captured the extraordinary behavior of water at those conditions," Marius Millot, a physicist at Lawrence Livermore National Laboratory in California, said in a statement from the laboratory. Millot was the leader author of a new study describing the work. Making the ice was complicated. First, the team compressed water into an ultrastrong cubic crystalline ice, in a different crystal form than what you see in ordinary ice cubes. To do that, the researchers used diamond anvil cells to apply 360,000 pounds per square inch (2.5 gigapascals (GPa) of pressure; that's about 25,000 times the atmospheric pressure on Earth). Next, the researchers heated and compressed the cells even further, using laser-driven shocks. Each crystal ice structure received up to six laser beams of more than 100 times that high pressure. "Because we pre-compressed the water, there is less shock-heating than if we shock-compressed ambient liquid water," Millot said. The new method lets researchers "access much colder states at high pressure than in previous shock-compression studies." Visualizations from computer simulations showing hydrogen atoms flow like a liquid within the solid lattice of oxygen in superionic ice. Once the superionic ice was ready, the team moved quickly to analyze its optical and thermodynamic properties. They had only 10 to 20 nanoseconds to perform the work, before pressure waves released the compression, and the water dissolved. And the results were bizarre. They found that the ice melts at an extraordinary 8,540 degrees Fahrenheit (4,725 degrees Celsius ) at 29 million pounds per square inch (200 GPa) of pressure. That pressure is about 2 million times the atmospheric pressure on Earth. "It's … mind-boggling that frozen water ice is present at thousands of degrees inside these planets, but that's what the experiments show," Raymond Jeanloz, a co-author of the study and planetary physicist at the University of California, Berkeley, said in the same statement. The new findings could provide a peek inside the interiors of planets such as Uranus and Neptune. Planetary scientists suggest these worlds' innards are composed of up to 65 percent water by mass, plus some ammonia and methane. Previous work suggested these planets would have "fully fluid" heat-transferring interiors, but the addition of superionic ice changes the picture. The new research instead proposes "a relatively thin layer of fluid and a large 'mantle' of superionic ice," the researchers said in the statement. That picture of the mini-giant planets' interiors would confirm a computer simulation performed a decade ago that tried to explain the weird magnetic fields at Uranus and Neptune. Uranus' magnetic field is tilted 59 degrees away from the planet's axis. Neptune's magnetic poles have a roughly 47-degree tilt. This is extreme compared with Earth, which has only an 11-degree tilt. Their magnetic fields also may behave differently; for example, Uranus' field may turn on and off like a strobe. More detailed study of these planets will have to wait until a spacecraft is available. Fortunately, NASA is proposing a Uranus and/or Neptune spacecraft that would zoom out to these planets sometime in the next few decades. Meanwhile, the experimenters plan to push their compression further to simulate conditions inside of even larger giant planets, such as Jupiter or Saturn. A study based on the research was published in February in the journal Nature Physics.